Flue Steam has been serving Southern California since 1971 – for over 40 years! Since the very beginning, we’ve been committed to making commercial kitchens safer and more efficient with our various services. You can really trust your commercial kitchen to our capable hands. Begin your partnership with Flue Steam and enjoy immediate peace of mind. We look forward to forging a lasting relationship with you. 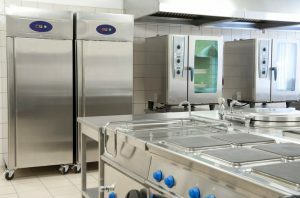 Call us at 800-700-FLUE to discuss your unique needs and to sign up for our awesome services for commercial kitchens. For over 40 years, commercial kitchen owners and managers have relied on the impeccable exhaust system cleaning services provided by Flue Steam. The purpose of kitchen exhaust systems is to safely remove hot air, odors, and vaporized grease, which are the natural byproducts of cooking, from your kitchen. If you fail to keep your kitchen exhaust system clean and in good repair, your exhaust system won’t be able to do its job effectively, and a flash fire could occur as grease builds up in the exhaust system ducts. No one wants to see a flash fire erupt in their commercial kitchen because of the dangers it poses to staff and customers, the resulting damage to expensive commercial kitchen equipment, and the loss of revenue when businesses must close for repairs. Dramatically reduce the risk of flash fires in your commercial kitchen by signing up for regular kitchen exhaust system cleaning from Flue Steam. Our technicians are always thorough and strive to reach every nook and cranny of your commercial kitchen exhaust system at every cleaning service. We provide complete exhaust system cleaning services so you won’t have to worry whether your kitchen complies with fire codes or is at risk of a flash fire. We highly recommend signing up for both hand scraping and steam cleaning services from Flue Steam. Both are effective ways of cleaning your kitchen exhaust system. Most kitchens require hand scraping about once a month, and we recommend that steam cleaning be done 2-4 times per year. These frequencies can vary depending on how much grease your kitchen utilizes on a regular basis. A sushi restaurant, for example, many not use much grease, but a fast food restaurant definitely needs to have its exhaust system cleaned more frequently. After each exhaust system cleaning service, we provide “Certificate of Performance” stickers. These serve as proof that you’ve fulfilled your NFPA code obligations to keep code inspectors satisfied. They can even help you safe money on your insurance bills. At each kitchen exhaust system cleaning visit, our technician will also perform an exhaust fan inspection. He or she will check the belts and other parts, plus grease your fan bearings. If your belts happen to be worn out and you have a replacement handy, you’ll install the new belt for you at no additional charge. It’s just one more example of how committed we are to making sure your exhaust system is functioning correctly so your kitchen runs efficiently and is 100% safe for your staff and customers. Begin your partnership with Flue Steam by calling 800-700-FLUE today.